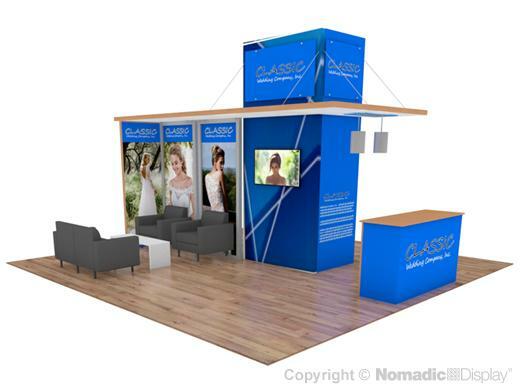 If you exhibit less than 3 times a year, you should consider a Nomadic trade show display rental solution. Our turnkey booth rental solutions are all inclusive and feature the most popular booth rental accessories. This 20' booth VersaWall rental features a reception counter which is a greeting station for entering visitors and soaring large format booth graphics that command attention. Engage visitors with looping presentations on wide screen monitors. The sitting area provides cozy comfort to get them to stay longer. The overhead plexi canopy offers a unique 3 dimensional look. The walk-in storage is perfect for locking up your products and computers.